See That There: Oh no! Am I becoming "trendy"? Oh no! Am I becoming "trendy"? So I don't usually follow trends. Actually, I try to avoid them and usually bash all the new trends that I see coming out. And because I need to follow upcoming trends as part of my job, I am usually dreading the day I start seeing some of them make it to the general public (ahem...skinny jeans on men). How gorgeous are these color block dresses? Love that they pair neutrals with a bright pop of color! 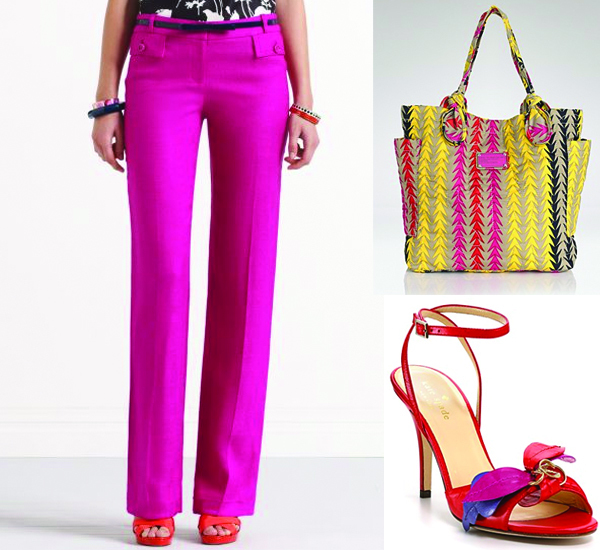 Fuchsia is a statement color and these pants would make a great one. But I'm also super excited to see it popping up as accents on accessories. Neons are back, but this year they take a sophisticated twist. Can a person be in love with a dress? I think so!